Many of Phuket’s expats have probably found themselves in more compromising situations than this. 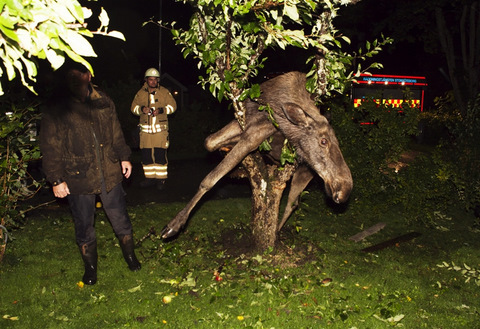 A heavily intoxicated Swedish moose had to be cut free from an apple tree after an boozy evening foraging for fermented fruit. Police believe the inebriated elk got into a state after eating fermented apples, and got stuck while trying to reach fruit higher up the tree. The binge-drinking beast somehow managed to wedge itself into the branches of the tree with all four legs off the ground. Fire crews had to chop branches off the tree to free the animal. Once free, it staggered off into nearby woods, presumably to sleep off the effects of its big night out. The moose was left physically unharmed by the incident but probably had a cracking hangover to nurse, along with the embarrassing memory.